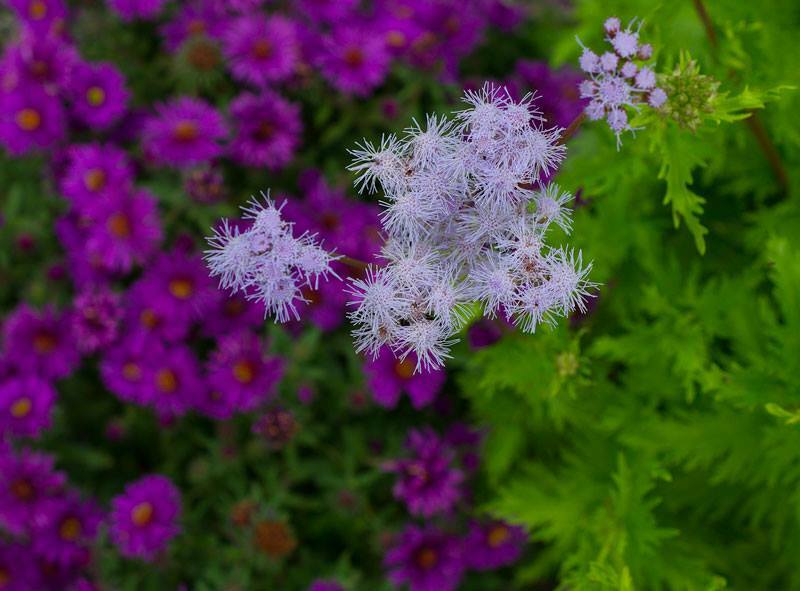 Palmleaf thoroughwort backed by New York aster ‘Purple Dome’. Photo by Debbie Roos. The N.C. Cooperative Extension, Chatham County Center will offer three fall pollinator conservation workshops and garden tours as part of its Enhancing Sustainability Series on Tuesday, September 11, Monday, September 17, and Saturday, September 22, starting at the Chatham County Agriculture & Conference Center in Pittsboro. This is the same workshop offered on three different dates to accommodate participants’ schedules and keep class size small. Chatham County Agricultural Extension Agent Debbie Roos will give an overview of North Carolina pollinators and discuss the role of native bees and managed bees in crop pollination. Participants will learn about the principles of planting a pollinator garden and how to select trees, shrubs, herbaceous perennials, herbs, vines, and grasses to attract a diversity of pollinators. Debbie will emphasize native plants but also include a few other plants that provide good resources. The workshop will conclude with a tour of N.C. Cooperative Extension of Chatham County’s pollinator garden at Chatham Mills. The garden is comprised of over 210 different species, 85% of which are native to North Carolina. Take a virtual tour of the pollinator garden to see how it progresses through the seasons! View the slideshow. I created a website just for the pollinator garden with lots of educational resources which you can visit on the Growing Small Farms website. Advance registration is required for these workshops. Space is limited so please register early to reserve your spot (they always fill up before the deadline!). The cost of the workshop is $25 and includes a flash drive of resources plus native perennial milkweed plants. Call 919-542-8244 or email Debbie Roos for more information. To register, click on the link below for the workshop you want to attend and you’ll be able to register and pay online. Monday, September 17 from 1:00-5:00 p.m.